November and December are full of reasons to celebrate for us. This week we celebrate Divali – basically Hindu Christmas. Last Sunday was Swedish Fathers Day. Both my husband and Alec have birthdays within a couple of weeks of each other. We have an anniversary (five years together!) and of course, Christmas. But for now we at least have figured out the first couple of occasions. For Fathers Day, Alec and my husband received robes. They love swimming class on Sundays but it’s a long cold rush from the pool area up to the change rooms, so we got (sort of matching) robes to make it warmer. Alec’s is by Joha and Sumit’s is Hugo Boss. Louis already has a little terry cloth robe that looks adorable hanging in our bathroom but doesn’t get any real use. Something to wear. A super cute sweater with faux suede shoulder patches and a pair of blue corduroys for Alec. And a knit romper with a faux suede pocket for little Louis. I love that the sweater and romper match! Books. The Wild Baby for Louis. I love this book. I remember it well from my own childhood (as I remember fondly so many of Barbro Lindgren’s wonderful books). I’m so excited to share this with both boys! And Pippi Longstocking for Alec. This is the first ever Pippi book and it’s a great first Pippi book for any child since it has some pictures and not to much text. And this translation is so much more authentic than later translations. I also like the pictures more than the modern ones. This is Alec’s first Astrid Lindgren book (strangely) but I think they read a lot of Pippi at nursery school. I think she is a fabulous character. I love that she is a girl that is strong and cocky but also kind. Toys. A classic wooden Brio bell rattle for Louis. Alec had one of these but it is the one toy that we managed to lose somewhere along the way. So Louis gets a new one. 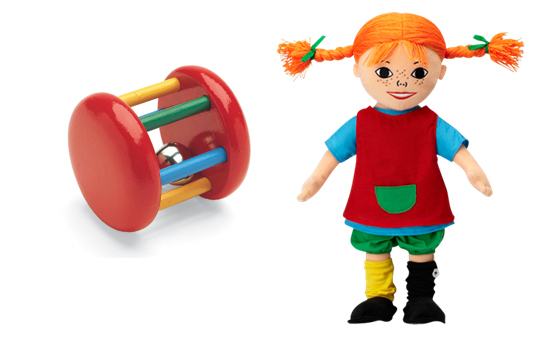 He won’t be ready to play with it for a bit yet though… And for Alec a Pippi doll. He is crazy about it and has had it with him to bed since he got it. What kind of gift policies do you have for your little ones?